This is Nana's new friend. He's a rhinoceros beetle named Thorne's Party. The beetle spends most of his time buried in his cage. When he's out and on Nana's arm, he likes to try to burrow into her. She describes that as disconcerting. I describe that as a living nightmare. Still, I'd love to have one for a pet, and I'm jealous of Nana. 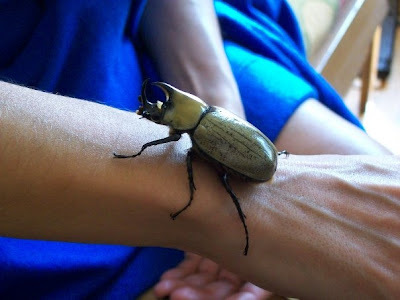 The rhinoceros beetle's primary importance to humans is its classification as a pest. The adult beetle isn't much of a problem (unless they manage to burrow into your skin). It's the wee ones, the larvae, that cause so much trouble. The massive maggots grubs like to dine on rotten wood, nectar, and tree sap, and are capable of taking down full grown palm and coconut trees. So, enjoy your pet, Nana. Think not of what it once was (a huge, wriggling maggot grub), and don't worry about it burrowing into your flesh. Just enjoy its current iteration as a creature who likes to cling to you. Much like my toddling son. WHY do I follow this blog? 9 times out of 10, I'm grossed out; the bugs in particular give me the heeby jeebies. Yipes. I thought that maggots were the larval form of flies and that beetle larvae were called grubs? "I thought that maggots were the larval form of flies and that beetle larvae were called grubs?" Scientific names should ALWAYS be italicized too (unless you're writing them yourself, in which case you can underline instead of italicize). There, I switched maggot to grub. Happy now? UGH... I absolutely HATE grubs. For some reason a couple years ago at our old house. It became infested with the things. Huge undulating wormy pulsating gooey slimey looking things that bleed this inky black crap. Absolutely disgusting when one of my dogs brought one in as a present for us and I had to throw it away.